Opposer failed to land any of its three offensive thrusts - likelihood of confusion, non-use, and fraud - in its opposition to registration of the mark BLACK BELT TV & Design (shown below) for television programming in the field of martial arts [TV disclaimed]. 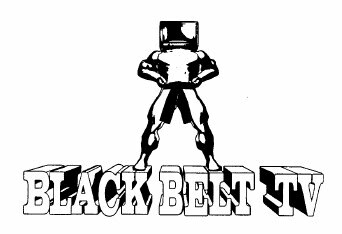 Its Section 2(d) claim misfired when it could not prove that its common law mark BLACKBELT TV for Internet martial arts broadcasts, achieved acquired distinctiveness before Applicant's first date of use, and its other two claims were factually barren. Threshold.TV, Inc. and Blackbelt TV, Inc. v. Metronome Enterprises, Inc., 96 USPQ2d 1031 (TTAB 2010) [precedential]. Evidentiary rulings: The TTAB first took up several objections to the submission of testimony from a prior civil action between the parties. The Board observed that testimony from another proceeding may be introduced only pursuant to a stipulation between the parties, if accepted by the Board, or on motion granted by the Board. Under Rule 2.122(f), "testimony" means only trial testimony or a discovery deposition used as trial testimony. Opposer objected, in its reply brief, to certain of Applicant's evidence. However, such objections must be raised in Opposer's trial brief, and cannot be held until reply. Therefore, these objections were waived. Applicant's motion to amend first use dates: Applicant unsuccessfully attempted to claim first use dates earlier than those set forth in its application. Such a change requires clear and convincing evidence, but Applicant offered no evidence to support the new dates, and so its motion was denied. Priority: Under the rule of Otto Roth, Opposer was required to show that it acquired trademark rights in BLACKBELT TV prior to Applicant 's first use date - its filing date for purposes here. The Board found that BLACKBELT TV is merely descriptive of a feature of Opposer's services, and is not inherently distinctive. As to acquired distinctiveness, Opposer pointed to a ruling in the prior civil action in support of its claim, but the Board countered with the "law of the case" doctrine because the Board had already decided earlier in the proceeding that the court's ruling had no collateral estoppel effect. Opposer also submitted evidence of acquired distinctiveness, but failed to submit sales figures, numbers of customers, surveys or third-party affidavits, and numbers of website visitors. Opposer's alleged 12 years of use of the mark did not alone establish secondary meaning. Moreover, Opposer did not submit evidence that its use of the mark was substantially exclusive. The Board ruled that Opposer had not established acquired distinctiveness prior to Applicant's filing date, and so it dismissed the Section 2(d) claim on the ground of failure to prove priority. Non-use: Opposer's only evidence on this point was its president's "obviously biased testimony" that he was "not familiar with applicant and its television programming services." That was not enough to avoid dismissal of this claim for lack of proof. Fraud: Opposer's proof of fraud came nowhere near the hilt, as required by the case law, and so it too was dismissed.